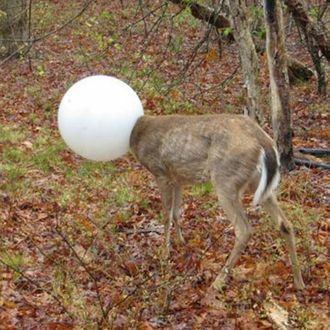 A deer decided to buck convention, and instead of running out into traffic at night and freezing up in front of an oncoming car like all of his friends, he just went and got his head caught in an actual light. Sure, it was actually the globe that covers a lightbulb, but let’s not split hairs. Jeff Hull, an officer with the New York State Department of Environmental Conservation, responded to reports about the deer. He approached it and attempted to pull off the light, but it got spooked, ran into a fallen tree, and fell down. The officer succeeded on his second attempt. Following the incident, the deer was not available for comment.